ABI Electronics will be represented at AMPER, 23RD International trade fair for electrotechnics, electronics, automation, communication, lighting and security technologies. 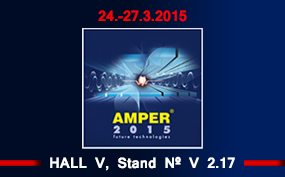 AMPER is the biggest meeting of the electro engineering industry professionals in the Czech ans Slovak Republic. For a chance to discover ABI's products and to discuss your requirements with our local partner AMTEST, please visit us at Hall V, Stand No V 2.17. More information about the show can be found here here.